A powerful gaming notebook built for a desk, not the road, with a loud fan under load and 8.6 pound heft. Everyone’s version of the ideal mobile gaming platform is different. According to my wife, a smartphone running Frozen Free Fall is all she needs (to drive me insane). My four-year-old’s tastes are more refined; he loves Nvidia’s Shield for its gamepad controller. Meanwhile, I’m spoiled by years of enthusiast-class PC hardware. I need native resolution and maxed-out details, else I’m just not interested. 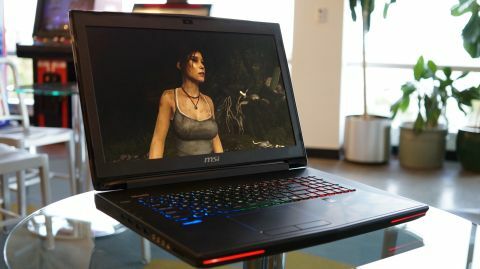 Apparently, MSI built its GT72 2QE Dominator Pro notebook for power users like me. There’s just one caveat: at over eight pounds and armed with a 17” screen, the GT72’s mobility is debatable. This is a desktop replacement in the truest sense. Then again, it does pack an impressive list of specifications. You get Intel’s Core i7-4710HQ host processor operating at a relatively conservative 2.5 GHz base clock, which jumps as high as 3.5 GHz with just a single core active. That’s fine by me—most games aren’t CPU-bound anyway. And for those that are, four Hyper-Threaded Haswell cores deftly alleviate bottlenecks. Graphics processing is the real determinant of gaming performance, and MSI arms you with the fastest solution available outside of a CrossFire or SLI configuration, Nvidia’s flagship GeForce GTX 980M. Its GM204 GPU is the same one that powers the desktop GeForce GTX 980. Only, in mobile trim, some of the chip’s resources are disabled to cut power consumption. The discrete module also packs 8GB of GDDR5 memory. That’s frankly overkill for a natively 1920x1080 panel. Now, there’s always the option to drive external displays using built-in mini-DisplayPort outputs or an HDMI connector. Conceivably, you could “dock” the GT72 at home and have your serious play time on a higher-res display. Even then, though, 4GB is ample. On the topic of gratuitousness, our GT72 2QE Dominator Pro sample came configured from XOTIC PC with 32GB of DDR3-1600 in four 8GB DIMMs. Stepping down to 16GB would have saved us close to $160. And performance wouldn’t have suffered for it, either. But storage is where XOTIC PC really went all-out. MSI has this feature called Super RAID 3 whereby as many as four SSDs can be configured in a striped array. There’s also room for a 2.5” hard drive. So, we ended up with four 256GB SSDs as a big 1TB pool, along with a separate 1TB disk. That’s simultaneously awesome and terrifying. On one hand, you’ll see sequential write performance in excess of 1GB/s. If any one drive fails, though, you lose the entire array’s information. Just be disciplined about moving your important stuff to the cloud or onto a NAS appliance. All of those components, taken together, draw quite a bit of power and dissipate significant thermal energy. A nine-cell 83 Wh battery sounds beefy, but if you plan to spend your time gaming, make sure that bundled 230W AC adapter is close by. It’ll keep your session from getting cut short and guarantee maximum performance—our testing showed graphics memory clocks dropped from 1250 to 800 MHz away from the wall. AC power is also a requisite of MSI’s SHIFT technology, a manual switch of sorts that lets you flip between three profiles of varying performance to control temperature. At idle, MSI’s dual-fan system is usually quiet—more so than some of the Ultrabooks in our lab. Fortunately, the GT72 employs capable cooling to cope with its big iron. At idle, MSI’s dual-fan system is usually quiet—more so than some of the Ultrabooks in our lab—though we did notice its tendency to spin up every few minutes for no good reason. The noise you hear under load can be customized to a degree using those SHIFT profiles. It’s only when you tax the GPU in Sport mode that the acoustics become distracting. Of course, that won’t be a problem if you’re gaming with headphones on, in which case MSI also implements its Cooler Boost 3 button, which further increases fan speed. The feature took our GTX 980M from 63 °C to 61 °C under the Sport profile in Metro Last Light. It’s really, really loud, though. The GT72 doesn’t get so hot that it would be uncomfortable resting in your lap, but it’s too bulky for comfortable lap use, anyway. The plastic feet that elevate the back of the laptop dig into your legs, so we prefer to keep the system on a desk. Outside of games, the GT72 serves as a competent entertainment platform. It comes equipped with a Blu-ray writer, 2.1-channel speakers, and up to 7.1-channel output via S/PDIF. The integrated Dynaudio system is particularly good for a laptop. Drivers at each end of this notebook facilitate impressive stereo separation. And although low-end frequencies aren’t particularly prominent, despite a small subwoofer, high- and mid-range sound is crisp, even at high volume. MSI doesn’t hesitate to call out the brands that helped with its design: Dynaudio on the speakers, Qualcomm Atheros for the Killer 802.11ac wireless and gigabit Ethernet networking, Creative Labs for the sound, and SteelSeries for the keyboard. Some gamers swear by this 102-key design, imbued with plenty of programmability thanks to SteelSeries’ Engine software. Personally, I’m not a fan of low-profile chiclet-style keys. They don’t convey enough feedback. But the three-zone backlighting really plays into MSI’s gamer theme. And I appreciate that whenever you connect a mouse (a must-have for gaming), the Synaptics trackpad is automatically disabled. On the left side of the GT72 MSI places a generous four USB 3.0 ports, a quartet of 3.5mm jacks for audio I/O, and a media card reader. The right hosts an additional pair of USB 3.0 ports and the optical drive. Around back, you’ll find a jack for wired Ethernet connectivity, two mini-DisplayPort outputs, HDMI, and the AC power input. There’s nothing up front except for two light strips, customizable through the SteelSeries Engine utility. Just the basics, really. Most of the chassis is plastic, aside from the brushed aluminum lid. Incidentally, that metal cover and the rubberized palm rest are what prove most susceptible to finger grease. But decked out in all-black with red trim and mesh highlights, the GT72 still manages to look handsome. It should probably come as no surprise that MSI’s GT72 is easier to service than more compact notebooks. Remove seven screws from the bottom, run a flat-edged screwdriver along the perimeter, and a panel pops off, exposing the M.2-based SSDs, hard drive, heat sink-laden CPU and graphics module, and memory modules. Interestingly, the battery isn’t easily accessible. But any seasoned system builder will have little trouble swapping core components in and out when an upgrade is warranted. Does it deliver performance to match? Remember, anything short of a desktop gaming experience, especially from a >$3,000 laptop, is going to have me looking elsewhere. In Metro Last Light, at 1920x1080 using high-quality settings, I recorded an average of 84 FPS plugged in to the wall. Out on the road, I averaged 49 FPS at the same settings. Tomb Raider cranked up to Ultra gave me an average of 86 FPS at the same resolution. Stepping away from an outlet, that number dropped to a still-respectable 73 FPS. Using Nvidia’s Battery Boost to limit frame rates will prolong your gaming sessions a little, but we still saw less than an hour of run time looping Unigine Valley with the GeForce GTX 980M capped at 60 FPS. And that was after the demo inexplicably slowed to a 10 FPS crawl halfway through. Rather than trying to sneak in another round of Call of Duty on the road, it’s easiest to think of the GT72 as a desktop-class enthusiast system that fits in a backpack, but really requires an AC adapter and sturdy tabletop to enjoy. In exchange, you’re treated to playable frame rates at demanding detail settings in the best-looking PC games.